Injection molding isn’t just for thermoplastics. The same process, with a few minor tweaks, can also be applied to synthetic rubbers. Having largely displaced natural rubber for almost all uses except automobile tires, modern elastomers (short for “elastic polymers”) are as specialized as thermoplastic resins are. Some are low cost, good versatile performers. Others are more expensive, but excel at chemical resistance or working temperature range. As a result, synthetic rubbers are used to make products for a lot of different sealing applications in industrial and consumer products. And how are those products made? Largely by rubber injection molding, which makes this an important manufacturing process. There are a lot of similarities between rubber injection molding and thermoplastic injection molding. Both processes begin by squeezing hot, liquid material into a mold under extreme pressure. Both are automated processes that use a sprue, runners, and cavities to make high-quality parts in large quantities at a low price per part. Also, many of the same design considerations we’ve discussed in previous posts apply to both processes: the benefits of multi-cavity tooling, the tradeoffs between the different types of gates, and importance of designing for manufacturing (DFM). Pressure: generally, higher pressure is required when injection molding synthetic rubber parts because the elastomers are usually more viscous than molten thermoplastic resins. Heating: For the liquid elastomer to solidify, it must cure by vulcanization (heating the synthetic rubber so that the polymers cross-link). Therefore, rubber injection molds are heated. This contrasts with plastic injection molding where one of the main jobs of the mold is to cool the resin-filled cavity as quickly as possible. In fact, the uncured rubber is pre-heated before it enters the mold, as this decreases both the required cure time and the viscosity of the molten rubber. Decreasing the viscosity of the rubber allows it to fill the mold quicker and completely. Teflon Rubber is very resistant to almost all industrial chemicals, including solvents like MEK and xylene. Teflon rubber is also tough, and being Teflon, has low friction. This elastomer also has a very wide working range. This combination of characteristics makes Teflon rubber an ideal O-ring and gasket material for chemical seals. EPDM is very resistant to heat, ozone and weather. This synthetic rubber is a great fit for electrical insulator applications due to its high electrical resistance. Weatherproofing products like weather-stripping and roof coatings are often made of EPDM because it has good water resistance. Chloroprene (e.g. Neoprene), like EPDM is weather resistant, but its niche application is for refrigeration seals due to its excellent resistance to both ammonia and Freon. This tough and economical elastomer is also FDA approved for food and beverage industry use. However, chloroprene is losing a lot of ground to nitrile, due to the latter’s competitive price and generally superior properties. Fluoroelastomers (including Viton) have a wide range of uses and the properties of a specific rubber depend mostly on the fluorine content and base polymer(s) used. Generally, Viton is compatible with hydrocarbons, making it a good O-ring material choice for engine seals. Nitrile (e.g. Buna N) is very widely used due to its exceptional oil resistance and low cost. Nitrile’s high abrasion resistance, high tensile strength and low compression set make it a good versatile synthetic rubber. There are other techniques to mass produce rubber parts, like compression molding and transfer molding, but injection molding has compelling advantages over both them. Because injection molding doesn’t require pre-forms like compression molding does, the labor associated with their production and placement is unnecessary, resulting in cost savings on every piece. Also, injection molding requires shorter cycle times than both of those other methods. This is an important advantage, since quicker cycle time translates into larger volumes and lower piece prices. 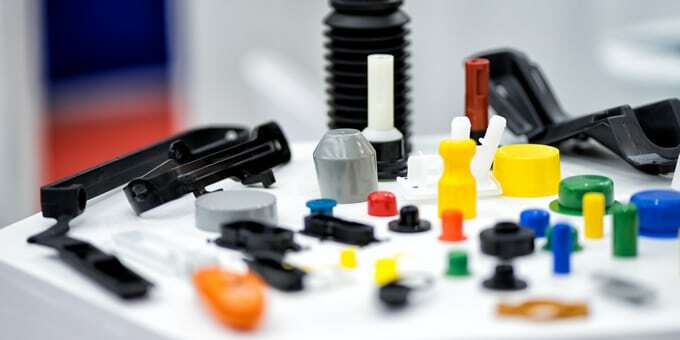 The third advantage rubber injection molding has over the other methods is that it results in very little waste, which can result in cost savings for expensive elastomers like FFKM. Rubber injection molding is one of our specialties here at Providence Enterprise. Contact us today to learn how our in-house expertise in rubber molding can help make a difference in the success of your project.